Today, we are pleased and proud to feature Ashur’s stellar blog post in honor of Shark Week! We hope you enjoy! In honor of the Discovery’s Shark Week and National Geographic’s SharkFest, this series of blog posts is dedicated to the flat sharks of oceans: skates, rays, guitarfish, chimaera. It’s not that we don’t love sharks, it’s just that their flatter siblings deserve more attention than they usually get. Regardless of how you feel about Shark Week, it’s become somewhat of an annual popular cultural institution in the United States since its advent in the late 1980s. Well, what about them? First off, let’s start with what is and isn’t a shark. The Shark Trust gives us an excellent visual taxonomy of sharks and their relatives – please note that is does not include dolphins, which are often assumed to be related to sharks. I may post about dolphins in the future, but suffice to say that they’re marine mammals, not even fish, which sharks are most certainly fish. 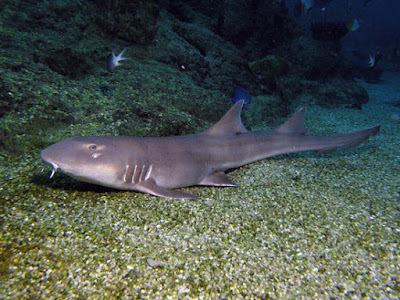 A zebra shark, which is both a fish and a shark, gets a belly rub in New Caledonia. Credit: Aquarium des Lagons and their YT channel. In particular, scroll down along the chart (Kingdom -> Phylum -> Class) until you get to ORDER, which is who we’ll be talking about today. In particular, this multi-part entry will cover members of Rajiformes (rays & skates) and Pristiophoriformes (sawfish), close kin of sharks. Throughout this entry I’ll be using the term “batoid”, taken from the superorder term Batoidea which encompasses rays, skates, mantas, torpedo fish and sawfish, among others. Acquired via: https://twitter.com/rabihalameddine/ Still not a shark, still not a fish. 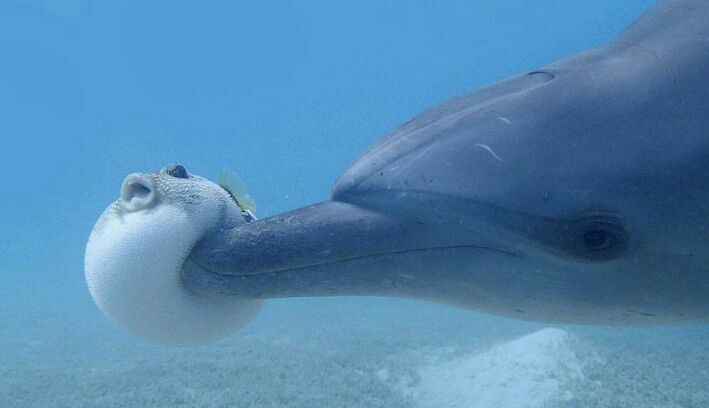 The puffer fish is a fish, though. 1) What’s a batoid? For that matter, what’s an elasmobranch? 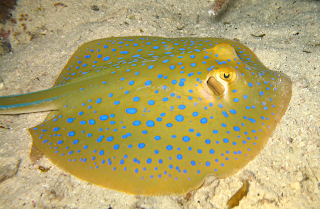 A batoid is a ray (e.g. manta ray) or a skate. Batoids are members of superorder Batoidea, which is under subclass Elasmobranchii. 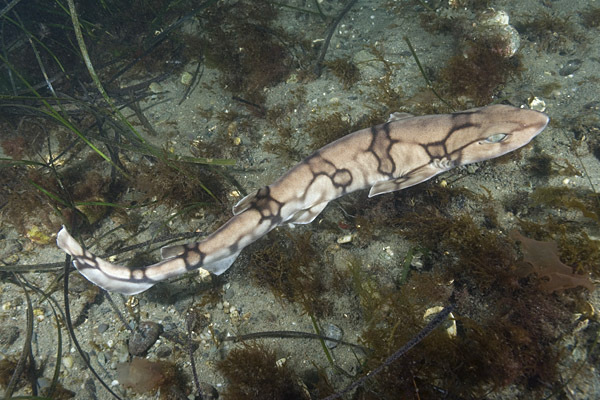 Elasmobranchii in turn is one of two subclasses under class Chondrichthyes, which contains cartilaginous fish, as opposed to bony fish (for the record, most fish are bony). The other member of this class is Holocephali, the chimaera, aka the rabbitfish, ghost shark, ratfish, etc. While chimaera are awesome, even fewer people care about them/know they exist than batoids and they merit their own entry in the future. 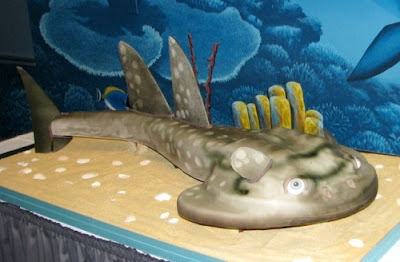 Elasmobranchii contains the sharks and the batoids, thus making an elasmobranch any member of subclass Elasmobranchii. Yes, this will be on the test. 2) So…what exactly are skates and rays, then? To be stately it crudely, they’re flat-bodied sharks. TIME FOR VISUAL AIDS! -Rays bear live young. Live birth by a manta in captivity (Japan in 2007) revealed that young manta rays come out rolled up like batoid burritos, with their wings folded. Unfortunately, this one appeared to fall victim to an abusive father after five days. -Skates lay eggs. These eggs (egg cases, really) are awesome and are colloquially known as mermaid’s purses. If you live near a coastline you may have been lucky enough to have found one on a beach. Some species of shark (such as dogfish) also produce this type of egg case. Here is a handy egg case ID chart for UK readers wondering what they’ve found on the beach. 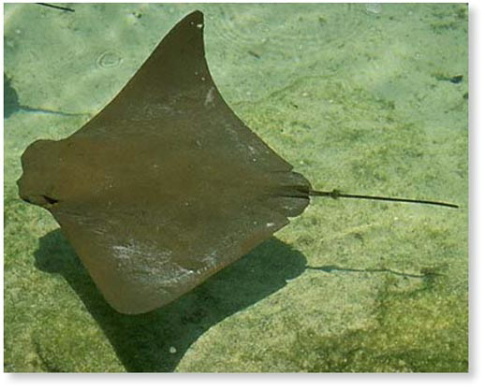 -Rays have thin, whiplike tails; the tails of skates tend to be fleshier. -Rays tend to be much larger than skates. You don’t see stuff like manta rays or the stingrays that get hauled out of the Mekong River in the skate family. 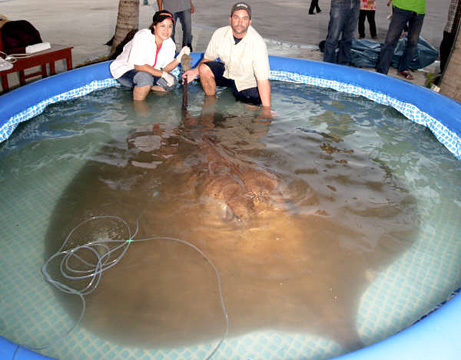 Freshwater giant stingray, caught in Thailand in 2009. -Skates don’t have the infamous tail barbs that some species of ray use for defense. 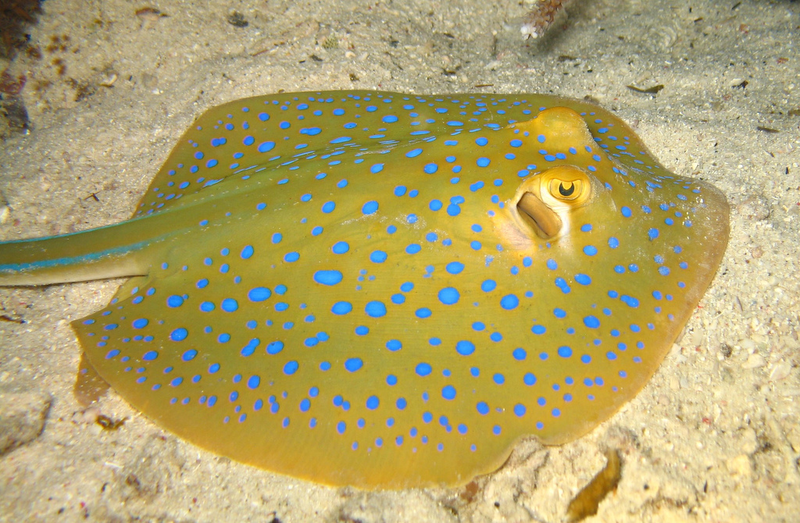 Instead, skates rely on thorns on the surface of their bodies. Check out the image of the “smooth” skate again. 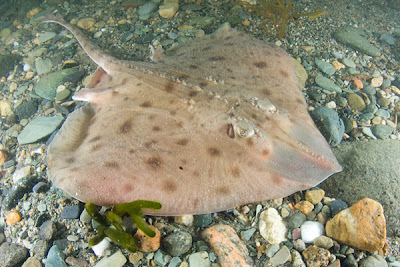 I can personally vouch that petting cownose rays is fun but I would not like to try it with a skate. -Additionally, there are differences in dentition: rays do the “crushing” plate form of dentition, skates have horrid little teeth. As is so often the case, the ReefQuest Centre for Shark Research has written up a nicer, cleaner and infinitely more professional explanation than I just provided. I will also take this opportunity just to promote their site in general, given I end up on quite regularly: elasmo-research.org, my poppets! 3) Just skates and rays? So what’s a sawfish? …okay, I wasn’t being completely honest with you. In addition to skates and rays, by far the most numerous members of the group, there are sawfish and guitarfish. There are further subdivisions of guitarfish into “guitarfish” and “wedgefish” but a) these terms don’t seem to be used consistently and b) I don’t care to delve into it, given colloquial fish names are tricky business on a good day. Suffice to say that both guitarfish and wedgefish are funky batoids that look like permutations on the theme of “shark-ray”. 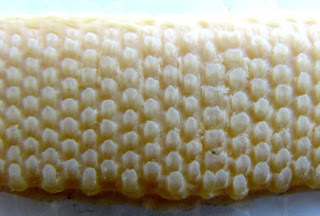 The spikes on the rostrum are not teeth but denticles. Denticles are a type of modified tooth, which while close to teeth, are not teeth. Bear in mind that the famous skin of sharks and sawfish are also covered in dermal denticles. If a sawfish loses a denticle, it does not grow back. However, that doesn’t make them not-pokey. The rostrum houses electroreceptors which allow the sawfish to detect the movement and even heartbeats of buried prey. In turn, rostrums (rostra?) are good tools for digging up said buried prey. Think of them as nature’s electroreceptive denticle-lined shovels. In a pinch, the sawfish can use them for slashing, too! 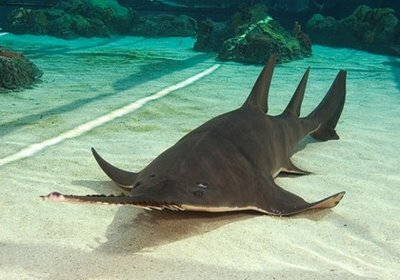 Like many large elasmobranchs, sawfish are endangered. Unfortunately, like so many creatures with interesting organs, humans have been hacking them off and selling them as elixirs, charms, markers of prestige, curios, medicine, etc. forever. In my quest for information on sawfish, I found an image of a sawfish that had had its rostrum cut off, been released and the wound had healed, effectively leaving the sawfish to live without one of its sensory organs. I’m pretty sure you can fill in the blanks on the implications of that. Additionally, their large oil-filled livers, bile, fins and skin are of commercial interest. It goes without saying that this is cruel and somewhat akin to shark finning, another practice that fills me with joy and mirth. For the curious, I believe the specific Ace of Cakes episode featuring Sweet Pea is called “Swimming With the Sharks”. I vaguely remember it because I was very excited about batoids on the television. Cakes aside, I’m not sure how much I can say about shark rays given there doesn’t seem to be a whole lot of information out there about them. I have learned that like everything else in the universe they get stuck in nets and make fisherfolk mad, they’re pretty much impossible to mistake for any other creature and the “bowmouthed” part of their name is derived from the silhouette of their head resembling a longbow. 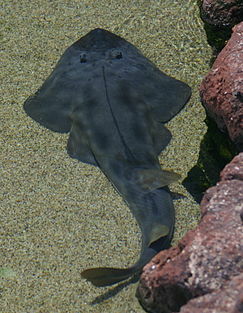 As for “shark ray”, well, they kind of look like someone smashed and shark and ray together and they’re the result. No idea about “mud skate” though; it’s oddly non-descriptive, given their unique appearance. Speaking of guitarfish, the Tennessee Aquarium Blog has a couple of nice entries with lovely images showing Gibson, a giant guitarfish who lived at the aquarium for a bit when floods hit Nashville (where Gibson typically resides, the subject of many of a TripAdvisor Review) in May of 2010. Entries on how one goes about moving a giant guitarfish and what one feeds such creatures follow. 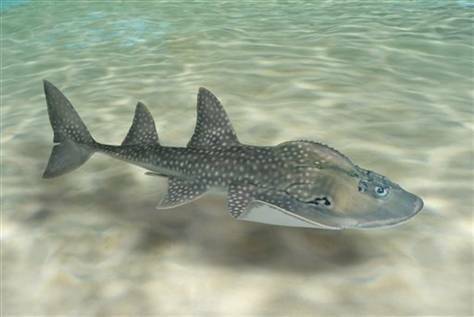 There’s even an online story for children about a guitarfish named Gilbert, although it’s a slightly less biologically accurate representation (in all fairness, the author acknowledges this). You should probably read it, you’ll thank me later. 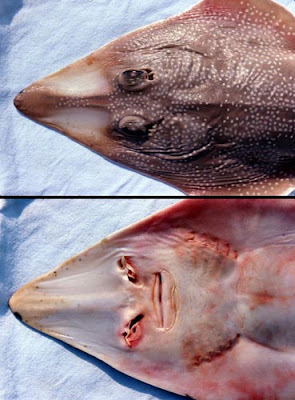 While it’s tempting to call the lower image the guitarfish’s “face”, that’s incorrect; its eyes are on the top (dorsal) side of its body while the holes located behind the eyes are the spiracles. See those holes sportily dotting the side of our very hungry caterpillar? 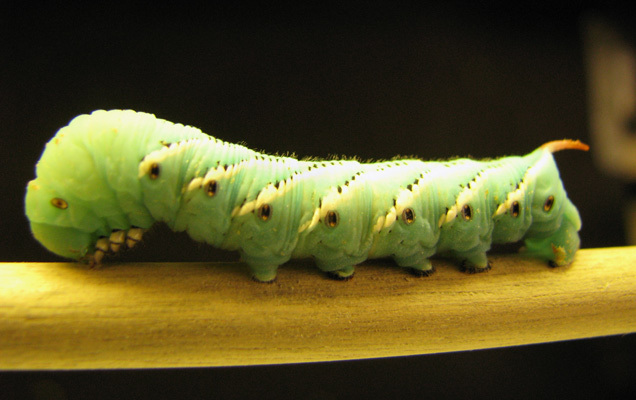 Those are their spiracles, which they can open and close at will. Spiracles do occur in other animals, but for purposes of our discussion we’ll focus on their presence in elasmobranchs (if you care you can look it up). Yes, elasmobranchs, not just batoids: sharks (though not all sharks, mind you) have spiracles too. 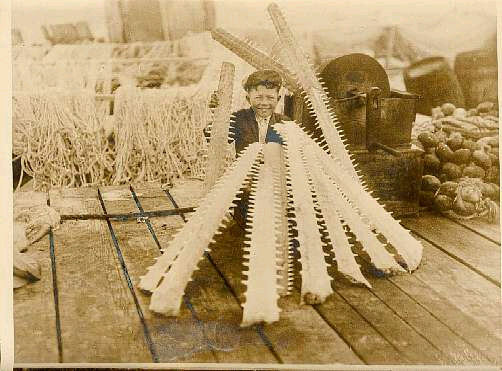 This particular set of jaws is used for crushing shelled mollusks into lunch. As I said before though, there’s diversity of ray teeth so here’s an illustration of dentition from perhaps the most familiar and unfairly maligned of batoids, the stingray. This example has the benefit of showing how the jaw actually fits into the fish’s head as well. The big question is, will skates bite you with their pointy little teeth? I searched the Internet in vain because the word “skate” is an unfortunate homograph in English. Additionally, there’s apparently some phenomenon related to hockey called “skate bite” that definitely does not involve batoid skates (although there is one that involves octopus). …I was still talking about guitarfish faces, wasn’t I? I suppose the important part isn’t so much knowing what every part of a batoid “face” is (though I encourage it! ), but the fact of the matter is that picking up on resemblance of the ventral side of batoids (particularly skates) to a vaguely human idea of a grimacing face is not new. A few hucksters back in the day (back in the day = at least as far back as the 1500s) decided to capitalize on this and gave us the Jenny Haniver: a the body of a dried skate or ray (which preserved the “face”) which was then cut and shaped to give to give it a vaguely anthropoid figure. 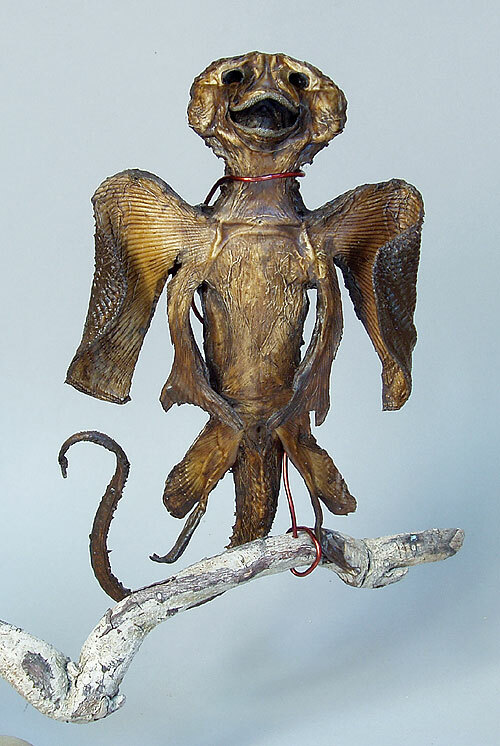 Some were purported to be the corpses of mermaids, some of devils (the pectoral fins of batoids came in handy for infernal capes), alien creatures, etc. Gesner, Conrad. (1587). Historiae animalium. 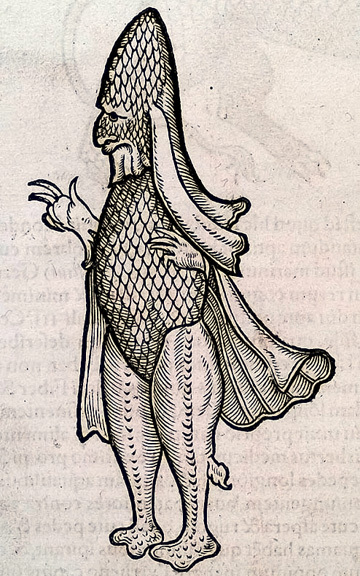 NOTE: If you haven’t checked out Conrad Gesner’s Historiae Animalium you should probably run, not walk, there now. It was published in 1587, which pretty much guarantees that is amazing and an utter delight. This text has the distinction of featuring the angriest porcupines and beavers I have ever seen in my life. We’ll stop right here before exploring individual groups of batoids in greater depth. In the coming weeks, I will post obligatory sections on three subjects that I kept running across as I’ve done research for this post: stingrays, manta rays and electric rays. Here’s a video from Sharklab-Malta chronicling the rescue, rehabilitation and release of an angular rough shark that was found left in a bucket. For a more in-depth description of the rescue, Oceanographic Magazine has a write-up. In the meantime, have a few shark and batoid-centric reading recommendations! This will be heavier on the “shark” end of things, as batoids do not appear have to experienced their own publishing renaissance quite yet. I’d also take a moment to recognize the Elasmodiver’s (referenced earlier in this entry) reading list – if you’re looking at getting deep into writings about sharks (especially from the angle of a scientist or a. His entire website is excellent and very informative, so I recommend a visit. The Shark Chronicles: A Scientist Tracks the Consummate Predator, by John A. Musick and Beverly McMillan. Many animals elicit the same mythical terror and awe as sharks, and yet we know little about these elusive, highly engineered creatures. John A. Musick and Beverly McMillan bring us along on a thrilling adventure as they chase sharks from Bear Gulch, Montana, to a whale shark-feeding station in Okinawa, by way of Alaska, the Bimini islands, and the most sophisticated shark-research labs in the world. En route we discover that sharks navigate using electromagnetic signals, have a bloodhound’s sense of smell, are both cold- and warm-blooded, and possess biochemical weapons, which, used properly, might indeed help fend off malignant tumors and microbes. Musick, who has spent over thirty years as a defender of the much-maligned shark, here excavates the mysterious lives of sharks from the dark recesses of the oceans–and raising the alarm about how fishing and industry are reducing their numbers and affecting their behavior. This captivating and educational scientific exploration challenges us to rethink our relationship with sharks, leaving us with the question: Are humans the prey, or the predator? Sharks of New England, by Alessandro de Maddalena. Lots of elasmobranch books are regional – as such, I thought it appropriate to include information on our local shark population. Readers who think sharks are a predominantly tropical species will be in for quite a surprise when they learn that the cold waters of New England are home to 33 different species. The aim of this book is to provide both accurate scientific information on sharks and to profile those species that inhabit the waters of New England. This book merits a mention because of a story included about the relationship between a diver and a manta ray, but feel free to enjoy all the rest as well! Unlikely Friendships documents one heartwarming tale after another of animals who, with nothing else in common, bond in the most unexpected ways. A cat and a bird. A mare and a fawn. An elephant and a sheep. A snake and a hamster. The well-documented stories of Koko the gorilla and All Ball the kitten; and the hippo Owen and the tortoise Mzee. And almost inexplicable stories of predators befriending prey—an Indian leopard slips into a village every night to sleep with a calf. Ms. Holland narrates the details and arc of each story, and also offers insights into why—how the young leopard, probably motherless, sought maternal comfort with the calf, and how a baby oryx inspired the same mothering instinct in the lionness. The Encyclopedia of Sharks, by Steve and Jane Parker. The Encyclopedia of Sharks is a richly illustrated and fact-filled reference on all the world’s species of sharks. The author debunks the fearful myths and fierce legends, providing straightforward facts and the latest research on sharks. More than 200 striking photographs show sharks in their natural habitats. Detailed drawings illustrate the anatomical features unique to sharks, such as their fearsome but short-lived teeth. Also included is a 50-page comprehensive, all-color section featuring and explaining the world’s most important breeds. Through its lively text, spectacular photography, and charts, maps and illustrations, The Encyclopedia of Sharks will encourage an understanding of these complex creatures. See you next entry, dear readers!